Two years on from the culmination of the California Hunger Strike (and without adequate response from the state) let’s consider what is at stake. These photos. These spaces. 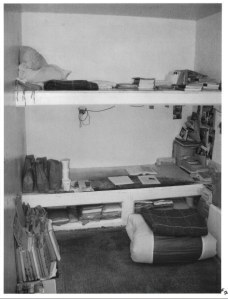 I have scanned and attached five photographs that were taken of Todd Ashker’s cell in the SHU at Pelican Bay State Prison, Short Corridor, in July 2007. Todd asked us to share them with whoever is interested. Todd Ashker has been in a Security Housing Unit (SHU) for more than 25 years, since August 1986, and in the Pelican Bay SHU nearly 22 years, since May 2, 1990. The following is his description of the attached photographs. 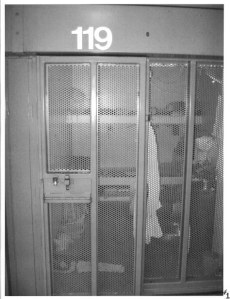 #1 Front view of cell D1-119. The locked tray slot is where I get my food trays, mail, etc.